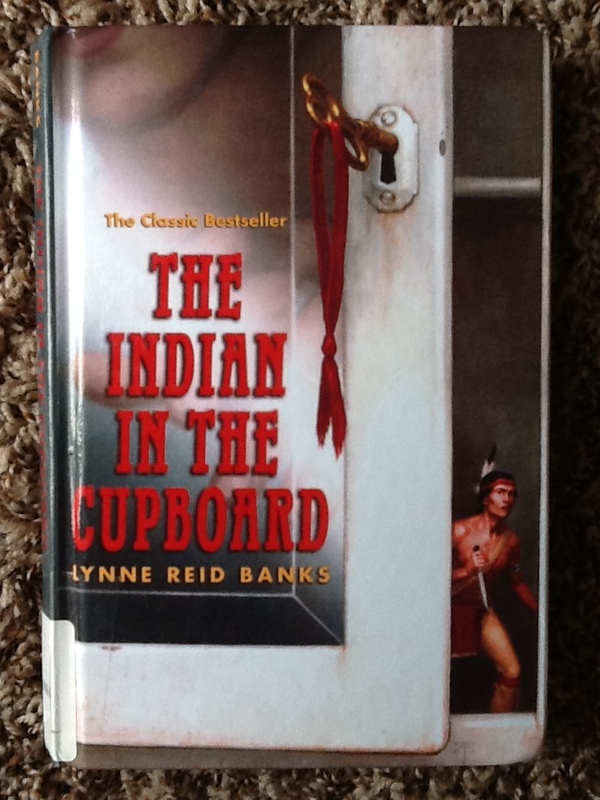 Ethnocentrism in The Indian in the Cupboard – The Bookshelf of Emily J.
Ah, The Indian in the Cupboard (1980) by Lynne Reid Banks . . . where do I begin? Do I start with the rampant racism and stereotypes, the taking of the name of “God” in vain (in a children’s book of all places), the anti-feminist overtones, or the pure delight in my daughter’s eyes and imagination as I read to her? This is a tough book for me to write about. I loved it as a child, and I remember the magical feeling I got when my mother read of Omri’s discovery that his plastic Indian figurine came to life when he put it in his cupboard and turned the key. It is every child’s delight to imagine that his or her toys could come to life, or that they could possibly have a life of their own independent of the child’s. This concept is what the popular Pixar Toy Story movies are based on. We love those movies at my house. My daughter loved the story. She could not wait to see what would happen next, just as Omri could not wait to visit his little live “Indian” after school. Omri hurries here and there to get things for his Indian, wakes up early to see how he’s doing, and ultimately realizes the value of human life. Just because something is small and seemingly helpless, does not mean it doesn’t have dignity. I see this theme as important because of the racial issues, with Omri being, presumably, a white kid in England who discovers the magic of his cupboard. I also see problems with the way Omri refers to the Indian as “his.” It reinforces the white man as conqueror story. Additionally, Omri and his friend Patrick bring a plastic cowboy to life. “Boo-Hoo” Boone immediately begins using racial slurs and uttering epithets. I understand that the author was trying to portray authenticity, as her characters were supposed to have come from another time and place through the cupboard, but it rubbed me the wrong way. I guess that’s because I have lived on two Native American reservations in my young life. The first was the Navajo reservation. 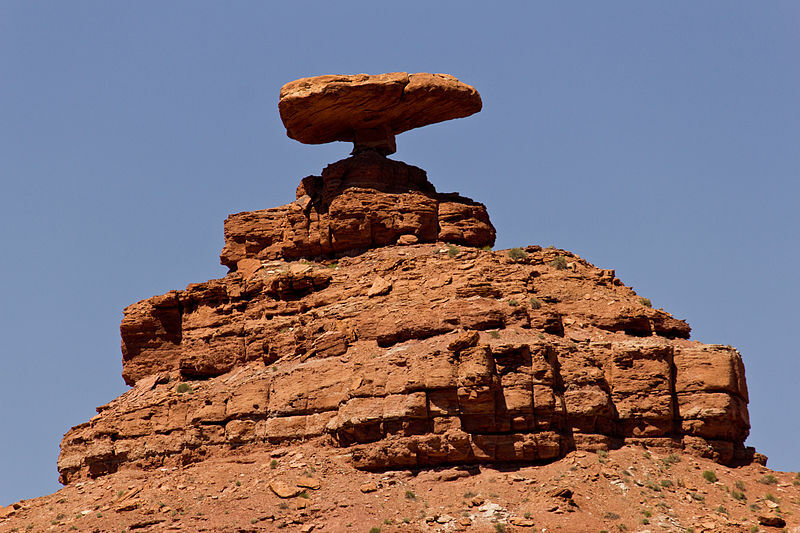 We lived in a trailer park in a tiny town called Mexican Hat (with a red rock formation of that shape) during one of my elementary school years. I had come from a white, suburban neighborhood in the Bay Area of California, and it was quite a culture shock for me. I ended up coming home from school early each day for a week or so crying and choking back tears and shame. I finally confessed to my mother that I felt so bad for the other children that I could not stand to be at school with them. They made my heart hurt. They lived without running water and did not have the things that I had. I had never seen poverty before, and once I got over my overwhelming empathy, I came to love those children. 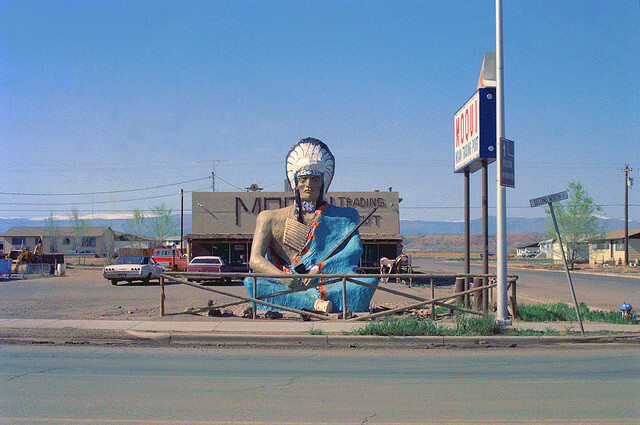 We later moved to the Ute reservation in northeastern Utah. I spent ten years there, making friends with kids whose last names were Wissiup, Secakuku, and Foolbear. I heard their talk, saw their culture, and realized that they were people. I attended powwows and a regular feature of our local community talent shows and celebrations were Native American princesses dancing in their jangling dresses, dresses that were lovingly crafted with leather, beads, and metal from their grandmothers’ own hands. My sisters and I often frequented a place called Moqui’s Trading Post, which featured many of the handmade goods from the reservation, including pots, leather belts, and beautiful beaded jewelry. So although I do not know everything there is to know about Native Americans and their cultures, I know enough to know that they are people and that old stereotypes of “savages” and “brutes” are unacceptable and offensive. I realize that The Indian in the Cupboard was written a while ago, but as a children’s author, I think Banks had more of a responsibility to depict her character drawn from an Iroquois brave more delicately and humanely. Maybe she does so as the story ends. Omri, Boone, and Little Bear certainly learn to love each other. Well, I was about to get off of my soapbox, when I realized that I need to address the feminist problems in the text. I didn’t have to explain any of my feminist objections to my daughter, for she objected to them herself without my saying a word. She lives in a time where these sorts of issues are normal, so to see them depicted so archaically really bothered her sensibilities. Toward the end, Omri lets Little Bear pick out a plastic figurine of a woman, a Native American woman, to be his wife. Omri promises to put her in the cupboard and make her real. When he does so, the woman, of course, has no objections to being Little Bear’s wife and immediately begins cooking and being domestic. All of this gave me a chance to have a great talk with my daughter on her feelings as a female and about her autonomy. I also got a chance to explain why we don’t refer to Native Americans as “savages” and why the book has made some ethnocentric mistakes. So although I take issue with some of the dated ideas and language, I did find it to be a great way to talk to my daughter about my concerns and about issues that she’s now old enough to process. Olivia loved the book. She wants to read the sequel together. I will do it, for her, and because I understand the magic of the story, but I object to the insensitive treatment and depiction of Native Americans in the book. Perhaps I am raising objections that don’t really matter or perhaps not many other people mind, but I do. I really do. Wow. I remember loving this book as a child too – it was actually set reading at school. It’s tough to know how much we should be censoring what our children read. But it sounds as if you’ve brought up an intelligent and inquisitive young girl – hopefully she’s getting even more out of it by being able to discuss the issues with you. I hope so. I actually don’t think books should be “censored,” but we should know what our children are reading (or what messages they may be hearing) and be aware of the issues and how to discuss them. Thanks for the comment! This kind of relates to the issues many people have with “Huckleberry Finn” and other Mark Twain works. They’re full of highly offensive stereotypes and racist language, but they’re also an accurate (and sometimes satirical) look at a different time and place. Just because something doesn’t fit into our modern, more culturally relativist society doesn’t mean it shouldn’t be read. I also remember loving this book as a child, and I think reading it with an eye for the issues it raises is a good strategy. Yes, exactly! Good connection to Adventures of Huckleberry Finn. It is still worth our time, we just have to remember that it is a product of its time. I felt similarly about my adult re-reading of Paul Bunyon stories. I was shocked to recall that I was fascinated with Paul Bunyon as a kid, and how grossly he ravaged the natural environment and was deified for it, which now, is completely unacceptable to me. I know the environment is not people. The issue is similar, not the same, but it goes to show the way culture changes over time, and how even children’s literature informs our kids politically. I think it’s worthy to discuss how old lore of this type no longer represents our values, letting kids make the discernment and set their own values more strongly. What a great comment, as usual Denise! It is hard and strange to read something again and realize how much your perspective has changed. I still think such literature is important, if, like you say, to just create conversation among our children. I haven’t read The Indian in the Cupboard since I was little, but I remember feeling as if there was magic about it at first. Then it seemed to get into fighting and the subject of war came up in a children’s fashion, and as a child, i did not like this too much. I did not relate it much to the history lessons I was learning in school, but I’m willing to bet those lessons were biased as well. We’ve come a long way – not that we don’t have farther to go. Good for you, taking an active interest to read what your child is reading. Thanks, Nicole. It really is a magical book, but it shows some ignorance and its time. It is amazing to me how far we have come since 1980, and you are right that there is always room for improvement. Thanks for the comment! I have the same type of problems with the Narnia books. I loved them as a hold but now can’t read them without wincing. In fact, I’d prefer not to read them at all but, as you’ve found children still enjoy what we as adults have learned to question. I think you’re taking the right approach in letting your daughter enjoy them but using the experience as an opportunity to discuss the questionable aspects of the text, especially as she identified some of those for herself. You clearly have a very thoughtful child. Yes, I do have a thoughtful child. She surprises me sometimes. I think most parents can say that! I hear you on the Lewis books. I actually have a review coming up of my memory of reading The Lion, The Witch, and The Wardrobe, but yeah, I wouldn’t want to reread it! I love the sharing of information that happens in these everyday-meanderings-of people-I’ve-never-met. I have to go read about Alice Paul now, and maybe watch Iron Jawed Angels, because none of the people in my everyday world have ever brought up her name and I’m an incurable information sponge who never got around to women’s studies. And yes, very lame when the Indian gal jumps right into domestic bliss. Blatant cliches are annoying to me, and this book has SO MANY. It does have many. I am very into women’s studies and issues, as I am sure is obvious. Check out Iron Jawed Angels. I was shocked and felt very grateful to her sacrifices and her willingness to fight so hard. Wow, I forgot about this book -my kids loved it. I have never been able to ban a book, especially since my kids attended a school that tried to ban certain books throughout their education. (Supposedly a non-denom school.) I prefered to take the approach of discussing why the book made people uncomfortable and afraid – even if they (kids) were too young for critical thinking, a brief history lesson was always fun. They liked having the “inside scoop” on the forbidden books. Goodness, I’d rather have an imaginative, well-informed, well-read child – able to make their own decisions than one who opts to follow the crowd, and play videogames like a zombie…. Yes, yes, and yes! No banning books, but let’s talk about the reasons that they scare people. With this book, let’s talk about why you shouldn’t stereotype a group of people or call them demeaning names. Excellent comment! Those conversations will help our children grow into responsible, thinking adults, for sure! Very though provocing. I remember my teacher in fourth grade reading this story (in Swedish) to us over the course of several weeks, twenty minutes each morning. I remember it quite well and that I liked it, so it was interesting to have this kind of perspective on it. I was going to say that with older books it’s not strange that these sort of views were in them, considering the society the authors themselves lived in, but I won’t because this was written 1980 and as such one would think some more modern views were already in place. Nonetheless, interesting! Right! It is hard to make sense of this book being a product of its time when I would like to think that things were somewhat “better” in terms of racism in 1980. But perhaps not! And maybe the author used the racist stereotypes to show the significance of the cooperation and love toward the end. We sure have! What an interesting “blast from the past.” I continually feel lucky to have been born when I was and where I was. We truly enjoy privileges that so many of our foremothers did not. Thanks for your comment! I did feel really uncomfortable at certain parts of this book, so I’m glad to know there are others thinking about this as well.